In the automotive industry, the SUV and crossover segment is one of the fastest growing markets. And why not> These vehicles offer a high-ride height and great interior space while, in most cases, also offering the comfortable and confident handling of a car. When matched with the Mercedes-Benz standard of engineering and interior luxury, this vehicle option becomes almost irresistible. If you are interested in a pre-owned Mercedes-Benz SUV in Carrollton TX near Dallas, Certified Autoplex offers a generous inventory of these high-end models at an extremely reasonable price point. Our dealership offers only the best pre-owned luxury and standard models. The majority of our used Mercedes-Benz SUVs are the Mercedes-Benz GLK from 2013, 2014, and 2015. 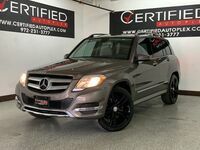 While this model name was changed to GLC for the 2016 model year, this vehicle maintains a long tradition of quality craftsmanship and premium features that you can expect from the brand that invented the internal combustion engine. Our inventory is always changing, so if you see a pre-owned Mercedes-Benz SUV that meets your driving and performance needs, be sure to schedule a test drive today at Certified Autoplex. With our evolving inventory, you will never be sure what automotive gem might be available. Our current pre-owned Mercedes-Benz SUV inventory in Carrollton TX offers models equipped with either rear-wheel drive or the 4MATIC® all-wheel drive system*.Other features that may be available in our inventory include leather seating, a luggage rack for the roof, and safety features like blind spot alerts and lane keeping assistance. Navigation and a panoramic sunroof are also available as of writing. Most models are also available with a Lifetime Powertrain Warranty. With our inventory always evolving here at Certified Autoplex, it's best to contact a member of our sales team or verify availability before stopping in. If you see a model you like in our pre-owned Mercedes-Benz SUV inventory, schedule a test drive today using the form on this page. Interested in a Pre-Owned Mercedes-Benz SUV?